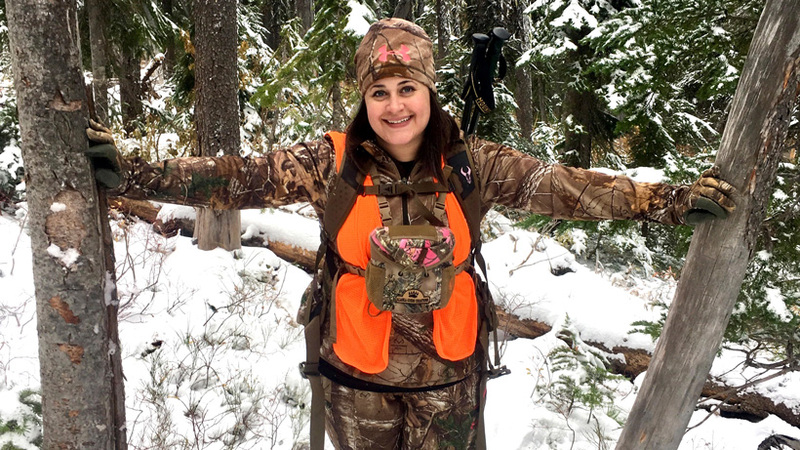 It had been two years since I had hunted mule deer in Montana due to the arrival of our daughter, Kinsleigh, who was born in August of 2016. My last season, which was in the fall of 2015, was definitely a tough one. I had worked so hard that year, hiked miles and miles, went out every chance I got, and took advantage of every minute of shooting light. Unfortunately, I was unsuccessful in filling my tag. 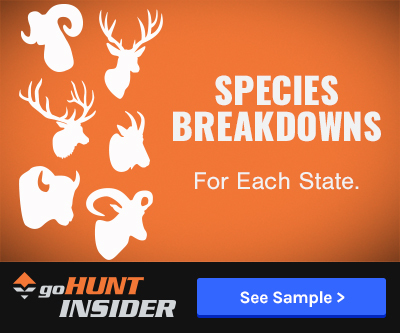 I did have a couple of opportunities on smaller bucks, but I was after a mature deer after already harvesting younger deer in my first few seasons of hunting. Even though I was unsuccessful in filling my tag that year, my husband, Dave, and I had a great time and made some incredible memories. Along with those memories, we also learned several lessons that would better us in the future. 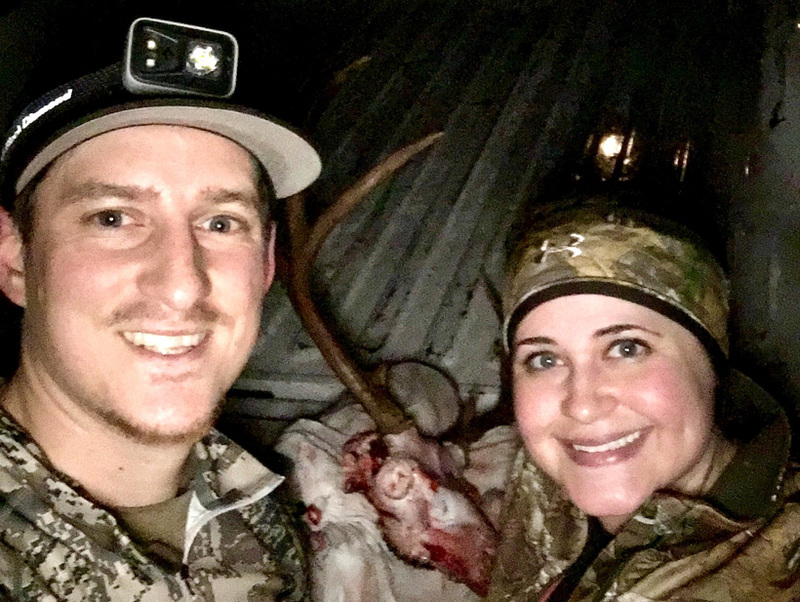 With Kinsleigh turning one-year-old this past fall, I felt more comfortable leaving her with her grandma and grandpa so I could try my luck at finding a mature mule deer. 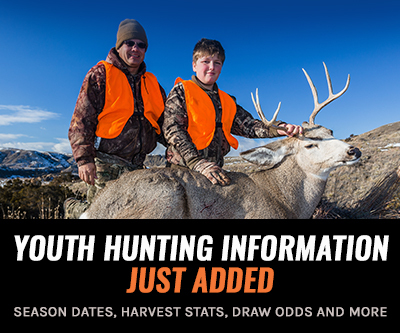 While I was excited to finally get out there, there was one small issue: Due to scheduling conflicts, Dave and I would only have two days to hunt together. Yes, only two! We were both highly stressed out about our time crunch but decided to keep a positive state of mind and focus on making the best out of the situation. Because two days is better than nothing, right? Opening day of Montana’s general season had finally arrived and we were about to start our first of two hunts for the year. We were heading into a brand new area and I wasn’t sure what to expect. We left the house a few hours before daylight and already a million things were going through my mind. Will we see a shooter buck? Will I get a shot? How bad of a hike will it be? Am I even ready for this? I tried to stay calm even though my heart felt like it was going to explode out of my chest and we hadn’t even gotten out of the truck yet! 30 minutes before shooting light and it’s time to start hiking in. The terrain wasn’t too bad starting out, but the nice trail we were walking on quickly turned into a tangle of alder and downed trees for as far as we could see. This was probably some of the worst terrain we had ever been in and the hike was testing me both physically and mentally, but I knew we had to just keep pushing on. After spending most of the morning battling the brush, we were discouraged after not turning up any deer. We decided to take a quick break to grab a snack and get our moods back up. We ended up spotting a cow moose and her calf across the draw and enjoyed just sitting and watching them go about their business. Moose are such magnificent animals and it’s such a treat to see them in the wild; they had no idea we were even there. After watching them wander off, we decide to do the same and continue to our destination. Not long after leaving, Dave spotted a herd of elk moving up a hillside across from us at a quick pace. Even though we weren’t after elk, I had an unpunched elk tag in my pocket and was more than happy to change gears. We quickly moved to an opening to try to get a shot on one of the bulls in the herd. We frantically rushed to find a rest for my gun as a bull stood broadside at around 375 yards. After finally getting settled, I was about to begin my shot sequence when they took off again and disappeared over the ridgeline. My heart sunk as I sat there, trying to process what had just happened. 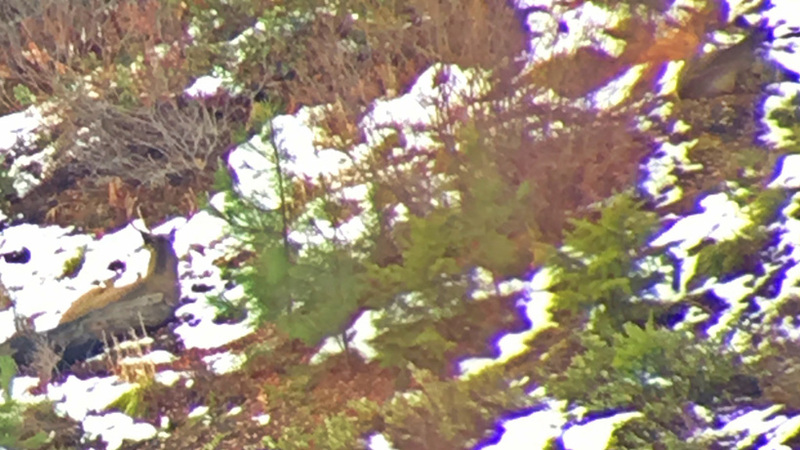 This was my first chance at a bull elk and now they were gone—just as quickly as they had appeared. Dave and I discussed the situation and both agreed that there was nothing more I could have done; we just ran out of time. The elk were moving too fast and the cards were stacked against us. With 6” of fresh snow on the ground, it was an easy decision to head after the herd and hopefully track them down. After an hour or so of hiking, we reached their tracks and begin following them into some dark timber. We followed the tracks for a few hours, but the elk never bedded down like we had hoped and, eventually, they began heading into a nasty canyon with tough access. By this time, every part of my body was aching and I was physically and mentally exhausted. We decided to start heading out and hike back to the truck. The day came to an end and all I could think about on the drive home was that we had only one other day to hunt. Would we find a buck? It was almost exactly a month later when our second and final day of hunting arrived: the day before Thanksgiving. This was going to be an afternoon hunt as we didn’t have anyone to watch Kinsleigh in the morning, but, at this point, we would take any time we got. A few week’s prior, Dave had found a new area and his hunting partner, Josh, and him were both able to take great bucks a few days apart. Now, with my hunt beginning, I was anxious to see if the deer were still in the area and if they were still rutting hard. After getting to the spot, I got out of the truck and looked at the long hike ahead of us. We had to follow along ridgeline up for a few miles before we could start glassing for mule deer. After about an hour and a half of hiking, we finally made it to the top and stopped for a quick break and to add some layers of clothes. There were times during that hike where I didn’t think I was going to make it, but I just kept telling myself that a mature buck could be somewhere just ahead and this would all be worth it. Once we had caught our breath, we began to slowly creep to the ridge edge where we could see into a large basin on the backside. We glassed the basin, but didn’t see anything immediately and began to work around the top to glass it from a few different angles. After a few minutes, Dave spotted a group of mule deer right below us. My heart started pounding, hoping one would be a buck. All we could see were three does, but we kept watching them, hopeful that a buck would pop out somewhere behind them. After watching them for about ten minutes, it became obvious that they were alone and we decided to move to an adjacent basin. As we got closer to the next basin my heart started pounding once again. We were moving slow, quiet, and were trying not to skyline ourselves. We got into a position to glass and immediately spotted another group of mule deer. Doe, doe, doe, doe...We knew there had to be a buck with them; it was prime time for the rut. As we continued glassing, more and more deer kept popping up. Half were bedded; half were feeding. We finally spotted a young buck bedded below all of the does and began to worry that he might be the only buck in the area. Still, we decided to move forward just a bit to see if we could see any better into the drainage. The buck was bedded with a single doe well below the other deer. The buck was still over 400 yards away so we started to head toward the opposite side of the canyon where we could use the ridgeline as cover and began dropping in elevation. We had dropped about 100 yards when we spotted a small clearing and a stump that was perfect for a rest. 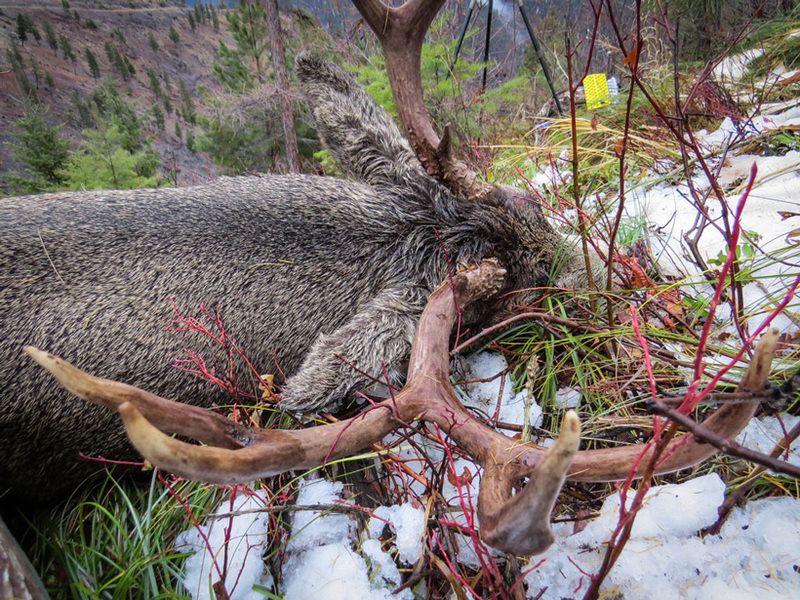 We slowly crept up to the edge, relocated the buck and ranged him at 268 yards. The buck was still bedded, but he had no idea we were even in the area, which gave us the advantage to wait him out. I got the gun situated on the stump and found the buck in the scope. Now, all I had to do was wait. I was shaking from anticipation and my heart was beating a million times per minute, but I knew that if I stayed calm I could make this shot. Dave had been watching through his binoculars the whole time and excitedly answered me back, “He’s down, you got him!” Tears instantly started rolling down my face and I began to shake from excitement and adrenaline. I couldn’t believe how perfect this stalk played out and that I now had “my buck” down! After the shot, we packed up our gear and waited a few minutes before beginning our hike down. In order to get to the buck, we had to drop down to the bottom of the canyon and climb up the other side. 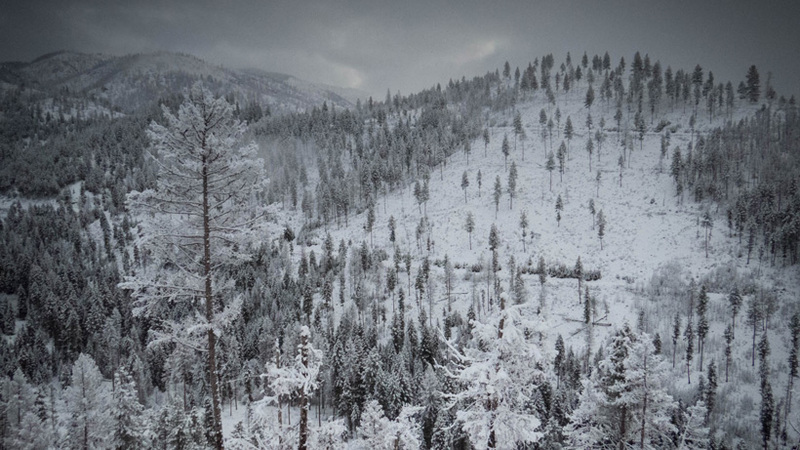 Crossing the canyon was tough with the slick snow, but we took our time and made it to the area the buck had been in fairly quickly. I found where the buck had been standing and could see where the buck had slid down the hill and into some alder brush. I took a few more steps down the hill and, suddenly, I could see him. “He’s a four-point!” I said as tears started flowing uncontrollably. I walked up to him and grabbed his antlers and stared in disbelief at what a gorgeous animal I had laying in front of me. I was truly blessed this day! 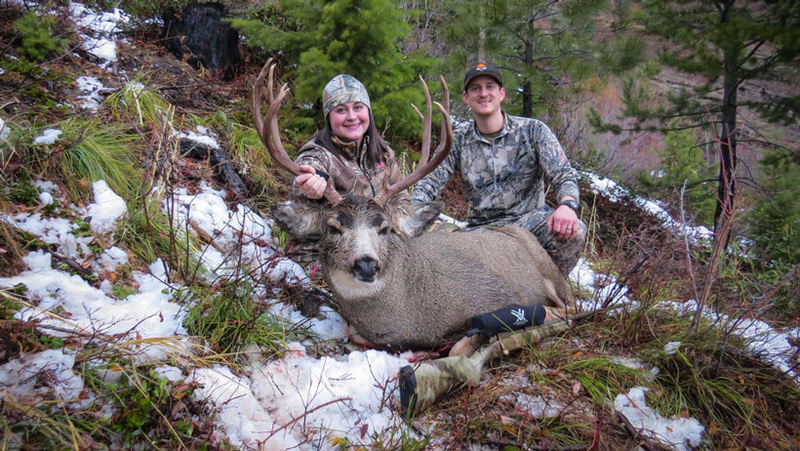 He was the biggest mule deer buck I had harvested in my hunting career and he was now going to top off our freezer with some incredible meat. 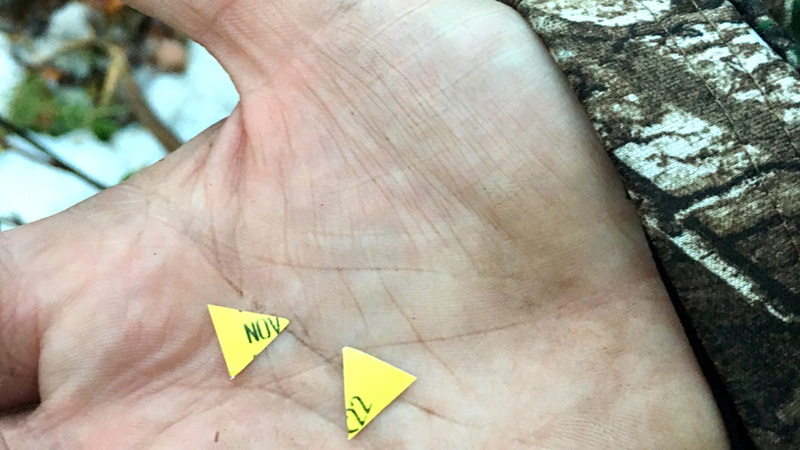 After notching my tag, we took photos of the deer and began the work of breaking him down. The buck had died way down in the canyon and we had a very long, steep hike up to the top before we would hit any flat ground. 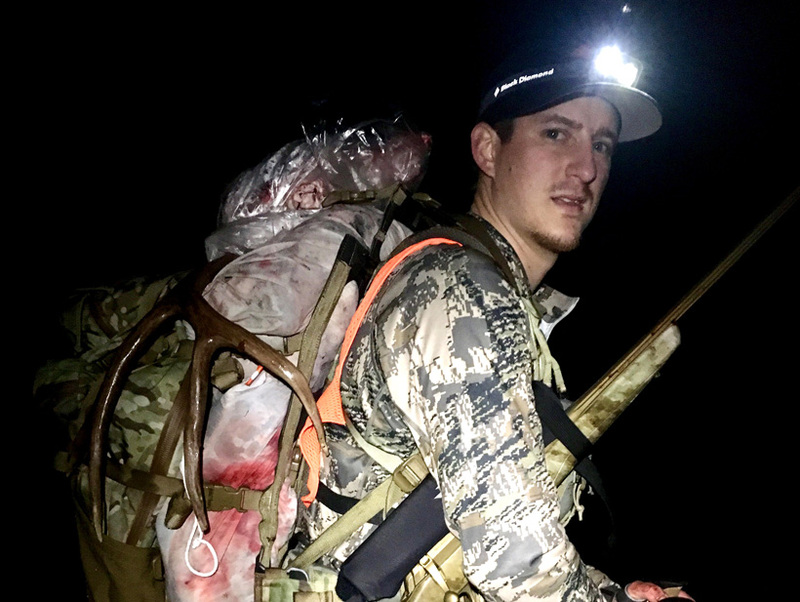 After getting the deer completely boned out, we loaded all of the game bags onto Dave’s pack; it was so heavy that I had to help him up! We grabbed our trekking poles, clicked on our headlamps and took off into the dark. The hike up was miserable and I honestly didn’t know if we would even make it out. Every part of my body was aching, but looking at Dave with my deer on his back kept me pushing on. After about an hour, we finally made it to the somewhat flat ground and could begin the downhill pack to the truck. The weather was perfect for a pack out and the darkness of the night couldn’t have been more relaxing. After hiking for three hours through the dark it was an indescribable feeling when our headlamps lit up the front of the truck. It was hard to believe that the hunt had come to an end. I was still trying to process all the events of the day and kept thinking how thankful and blessed I was. Everything I had worked for the last few seasons had finally paid off and Dave and I had memories to last a lifetime. 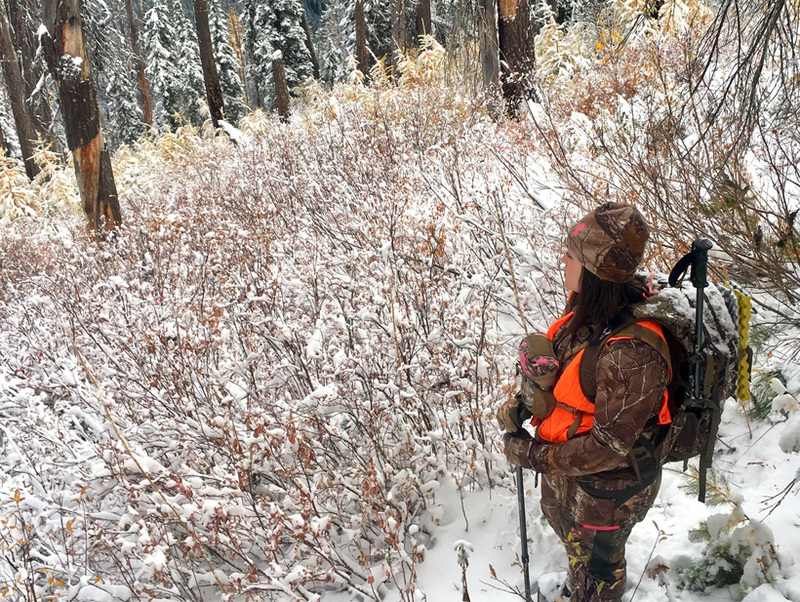 Hunting isn’t just about the harvest; it’s how it makes you feel and the memories you make with loved ones. 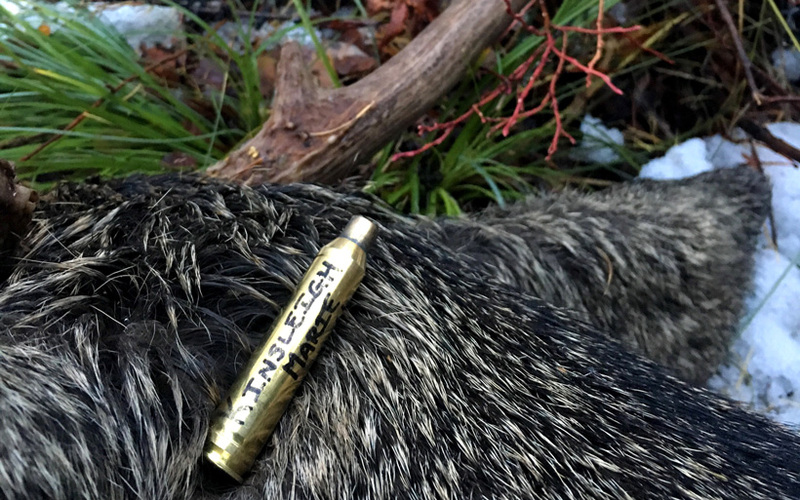 Since Kinsleigh has arrived, I feel like I am much more compassionate and appreciative of the animals that we hunt. They have given their lives to feed my family and this is something we cherish deeply. I want Kinsleigh to grow up having the respect and compassion Dave and I have for animals and their surroundings and to know that hard work will always pay off in the end. This hunt could not have been scripted any better and all of the pain and hard work just made the success that much more incredible. Thank you Erik, means a lot! 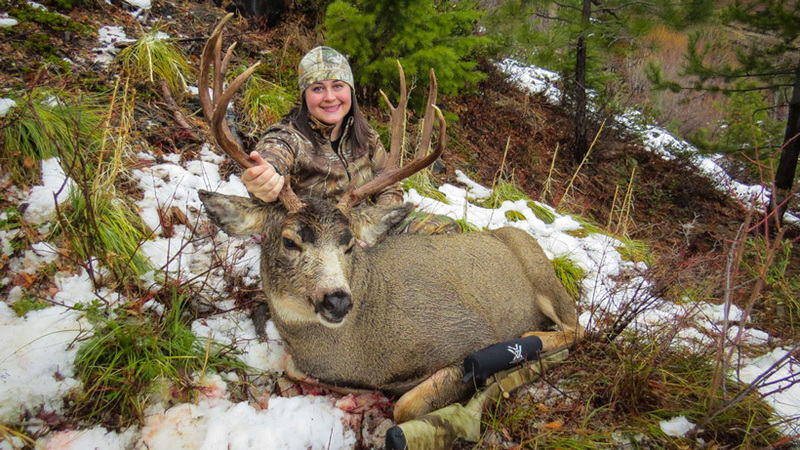 Congrats to you as well on getting your first MT mule deer, thats so awesome! The best and healthiest kind of meat there is...enjoy! Congrats! 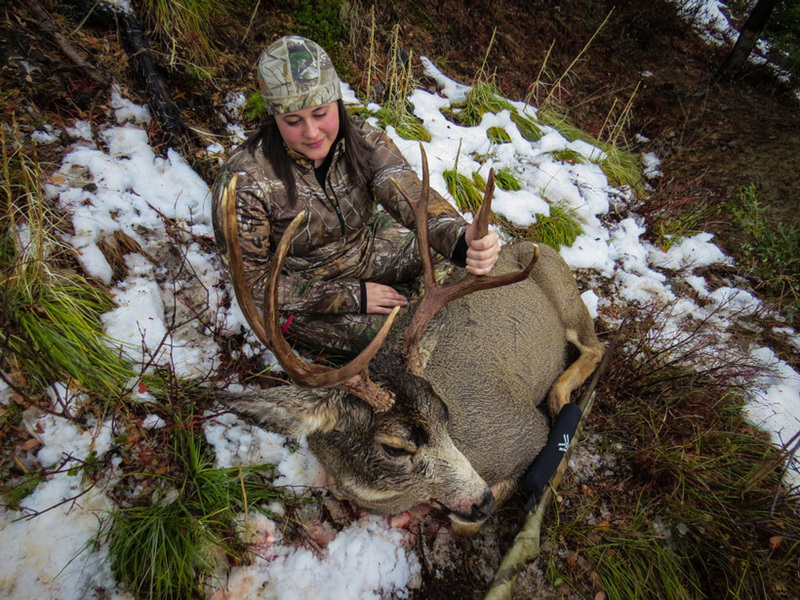 What an awesome buck and story. I shot my first mule deer this year in Montana and cried when I got up to him. All the years of planning and two weeks of hiking got to me, almost a 5 mile pack out made me cry some more...but so worth it, carving into a leg roast last night and all the memories return. We are lucky to be eating the best meat on the planet all year, cheers! Thanks so much Seth & Dennis for your kind words!! Congrats! Always nice when hard work is rewarded. Congrats on the really fine deer rack, lifetime memories and I hope the quality meat in your freezer felt like having extra money in the bank.